The exploration of summer pinks continues with Te Mania Nelson Pinot Noir Rosé 2016 – certified organic, suitable for vegans, 12.5% alcohol, $21.99 RRP. temaniawines.co.nz. The bouquet of this light cherry-red hued rosé tantalised me as I was taking the photo, like a bowl of summer berries wafting out of the glass as I played around with the position of the bottle and the glass on my sloping concrete patio – but later, with my nose right into the glass the aromas are more earthy and savoury – like you expect mainstream pinot to be – plus a bit of rhubarb possibly. The taste is crisp and juicy with flavours of red apples and something else a little different to the norm – perhaps wild strawberries or possibly that rhubarb I mentioned. Yes! Rhubarb and lemon. It’s quite quenching and being dry, not sweet, makes it ultra appealing for a pre-dinner aperitif. Sometimes the sweeter roses are out of balance, this one hums along nicely and I love the aftertaste of bittersweet red fruits – like wild strawberries and raspberries along with a biting-into-a–crunchy-red-apple kick. I noticed as the wine warmed up a little viscosity to the texture developed and a little sweetness was more apparent, so be sure to put the bottle back in the fridge or into a cooler after you have poured to keep it chilled. The back label suggests Turkish Delight but I didn’t get anything as rich and powerful as that. I decided to match to prawns – the ones you buy on a stick from the supermarket serve-over section, great to buy on special when they are $1 each. As they come into New Zealand pre-frozen my supermarket also has them in the freezer section in trays of three or four sticks and I buy them to go into my own freezer because they quickly thaw out when you want something light and quick. I cooked two sticks of garlic and butter prawns and one stick of chilli prawns and the chilli won hands down. My accompanying salad also with peppery home-grown rocket and Thai basil also especially good. 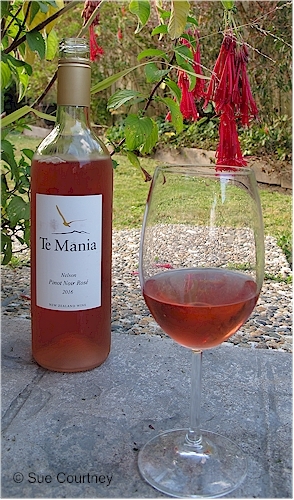 This entry was posted in #nzwine, nelson, rose and tagged 2016, organic, prawns, Te Mania, vegan by Sue Courtney. Bookmark the permalink.